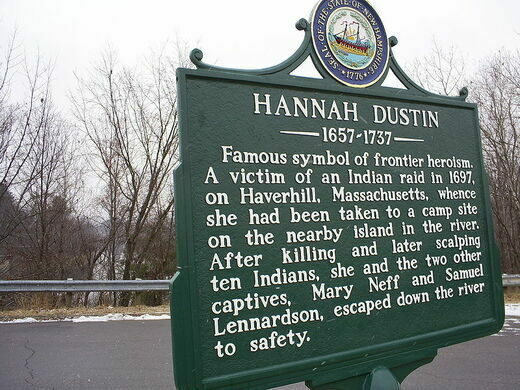 On March 16, 1697 a group of Abenaki Indians raided and attacked the Haverhill, Massachusetts home of Thomas and Hannah Dustin. Thomas and eight children escaped, but Hannah, neighbor Mary Neff, and Hannah’s week old infant were captured and forced out into the surrounding wilderness. The captors realized that the infant would slow their escape and relatively quickly they (in)famously “dashed out its brains against an apple tree.” The remaining captives were marched north towards Canada. One night, as they reached an island near where the Contoocook River joins the Merrimack River, the captors failed to set an overnight watch. 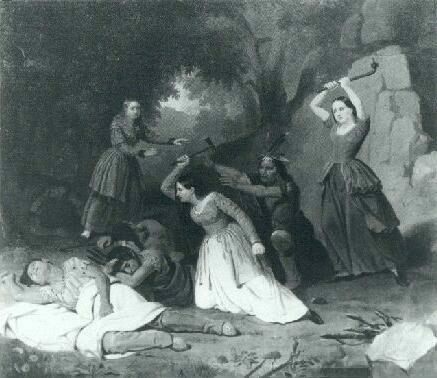 That night Hannah, Mary, and a fourteen year old boy named Samuel Lennardson killed 10 of the 12 Abenaki (including 6 children) with pilfered tomahawks - a woman and child escaped. The fleeing captives sank all but one canoe, took that canoe and headed downstream. When Hannah realized that she needed some proof of what would be a barely believable story, the party returned to the island and took scalps off the dead bodies. Upon her return, Hannah (via her husband) was paid a bounty of 25 pounds for the scalps; Mary and Samuel split an additional 25. Accounts of her story of escape and brutal retaliation turned her into a heroic figure, whose tale was retold (and embellished) many times. In 1874 this monument was erected in her memory on the site of the massacre, believed to be the first statue of a woman erected in this country. 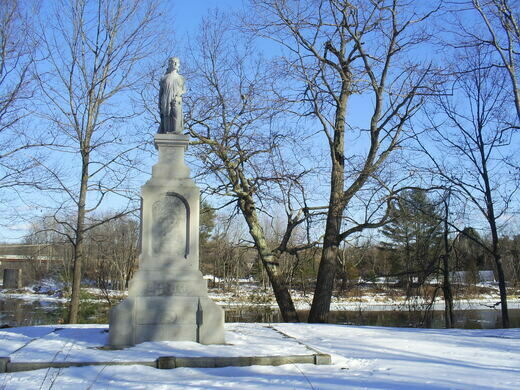 A second statue stands in Haverhill town square, close to where some artifacts related to her life are held at the Haverhill Historical Society. The historical marker is located next to a Park and Ride parking lot. You can park there. At the end of the parking lot is a path. Follow the path down to a sign. You should see a railroad bridge. On the left side of the bridge is a pedestrian walkway. You can cross to the island on this bridge. The statue is clearly visible and straight ahead once you cross the bridge.